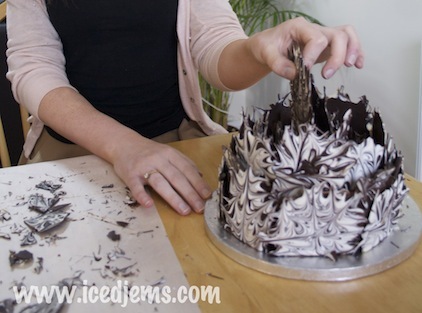 Grab your iced cake to start, the final cake looks like it has multiple tiers but thats just the effect of the chocolate decorations. 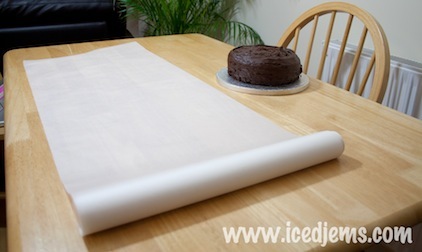 Make sure you have a clear workspace and cover it with greaseproof paper. 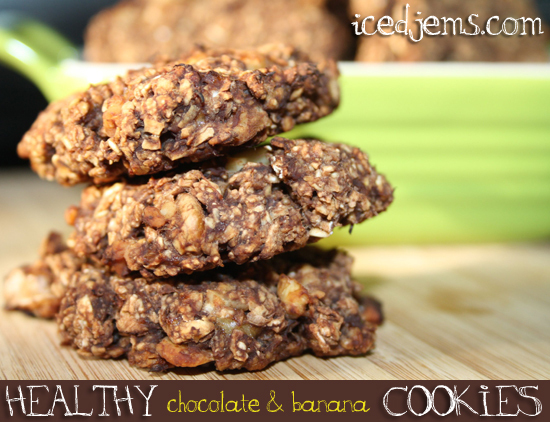 Now all you need is the chocolate – I used a mixture of White and Dark Chocolate, the flavours were great together! Make sure you get a good liquid consistency before taking off the heat (add vegetable oil if you need to). 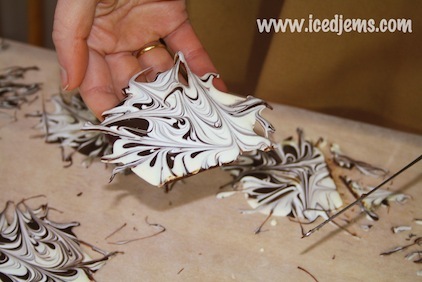 …then spoon a little white chocolate around the edges of the Dark chocolate circles. 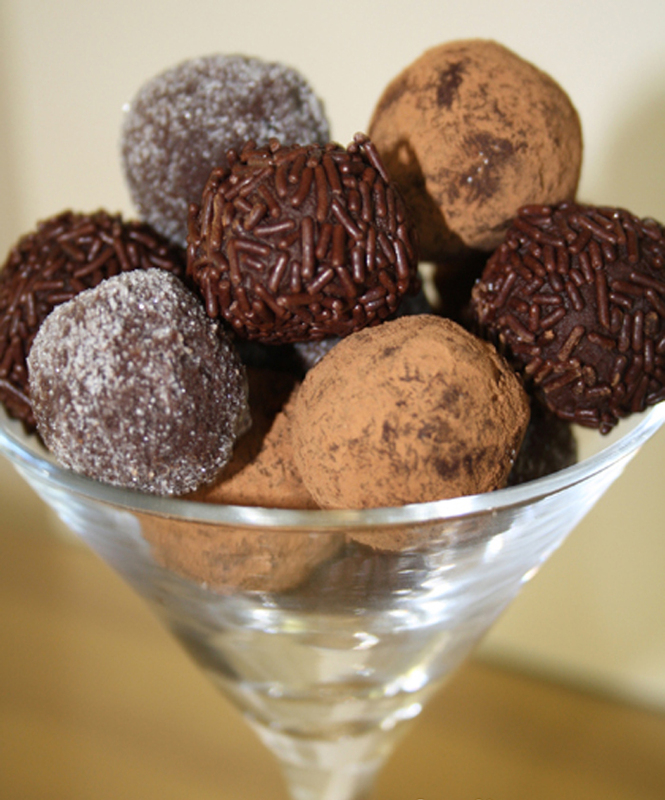 Now let the chocolate set – do not attempt to lift these up too soon, I know its tempting, they look and smell so good, but back away from the chocolate until completely set! 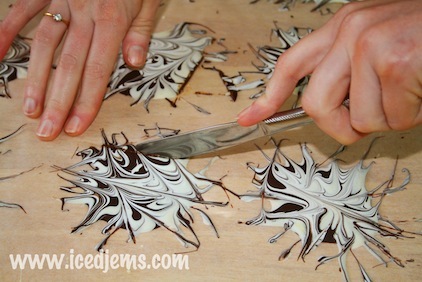 Ok once they’re completely set, dip a knife in hot water then cut through the shapes to create one flat edge. 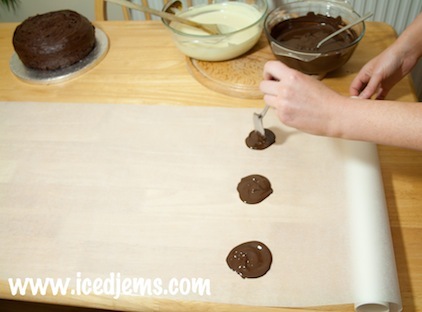 Now spread a little melted chocolate on the back, this will act as a glue to stick it to the cake. 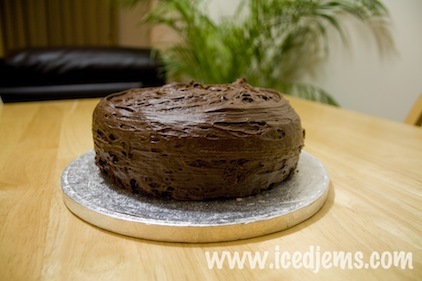 …then cut a circle about 1/2 inch deep into the cake, you can slot your second layer of chocolate shapes into this. Finally stick in your extra large shape into the centre of the cake. I had a few leftover shapes also that I broke up and stuck into a few gaps! Told you it was simple! Enjoy having a go, I’d love to see you have a go in different colours! 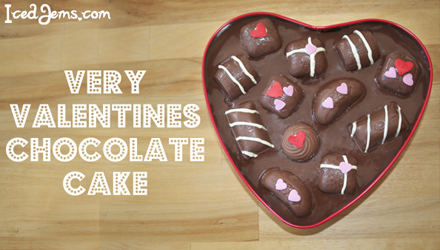 How many chocolate pieces did you make total? Stunning!! Thanks for sharing this fantastic tutorial!! This is incredible…will def give this a go! 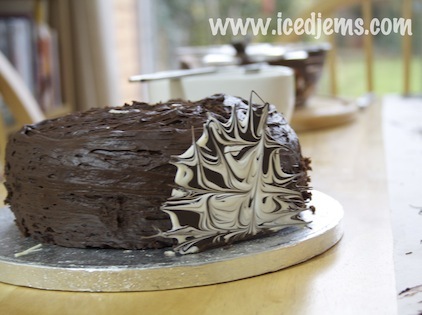 Im going to try this today, did you just use buttercream to ice the cake, do u think chocolate ganache would work aswell would it not sick to it? 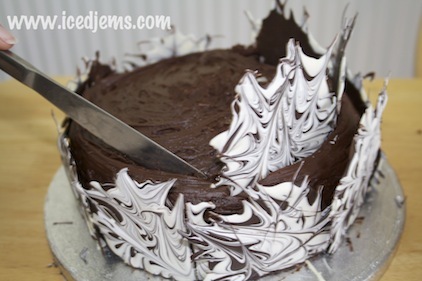 Kim, chocolate ganache would work great as it sets a bit harder than buttercream, but yes buttercream is what I used 🙂 I’d love to see a picture of the final thing – be sure to upload it to the facebook group! You are *fantastic*!! I can’t get over your creativity… BUT- how do us mere mortals CUT such a pretty cake?? How did YOU cut it?! I’d end up breaking it all into pieces- which would definitely be illegal in the baking biz. Hi jem,how much chocolate do you need? Just wanted to let you know that I’ll be making this tomorrow for my bf’s birthday. 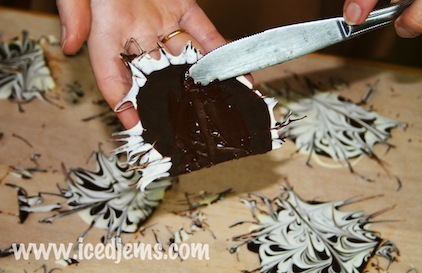 I’m sooper-dooper lazy (or busy, whichever), so instead of chocolate icing, I’m making a white cream cheese frosting for the cake (three layers), but following the recipe to the ‘t’ for the beautiful white and dark chocolate designs… I’ll post the pics of the result tomorrow or Monday!! Hiya i have a question? 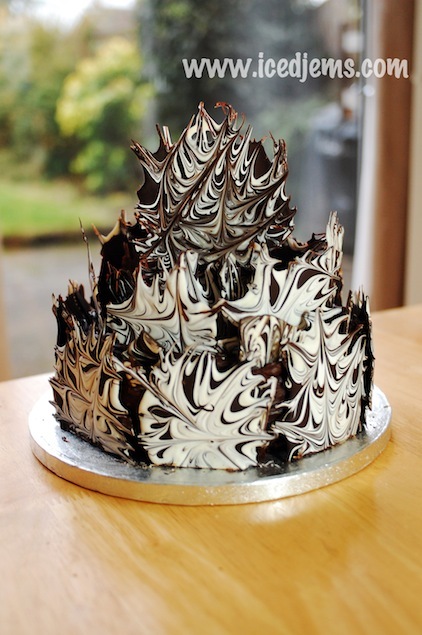 I attempted to do this gorgeous cake using different colours as suggested but after adding food colouring to the chocolate it turned into a crumbly mess and then once i’d managed to get it back to a decent consistency the chocolate looked great on paper but it wouldn’t set even in the freezer…. any tips on what i did wrong and to correct them cos i really love this cake! Its my boyfriends birthday coming up and im gonna be sure to impress him by giving this a go!. Kirsty: I’m guessing you probably used the wrong kind of food coloring. You can’t use regular food color for chocolate, you need to use candy color and your chocolate will come out perfect in any color. Goood Luck, Hope this helps. It’s beautiful and I might even make it, but, let’s see you cut it. My daughters 22nd birthday is on the 25th. She has requested a strawberry rhubarb pie and I will be making it – but since I am not a fan of that and I’m sure not everybody is – I will be attempting to make this cake as well. 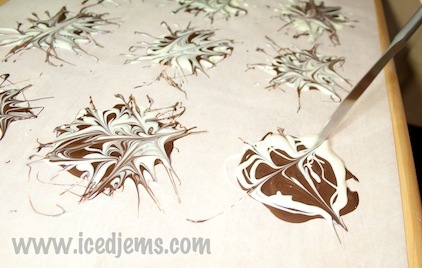 Our bulk stores sell all colours of chocolate but I love the white and dark chocolate affect!! Thanks for such a beautiful idea!! I have never seen a cake like this before! Very nice and creative. 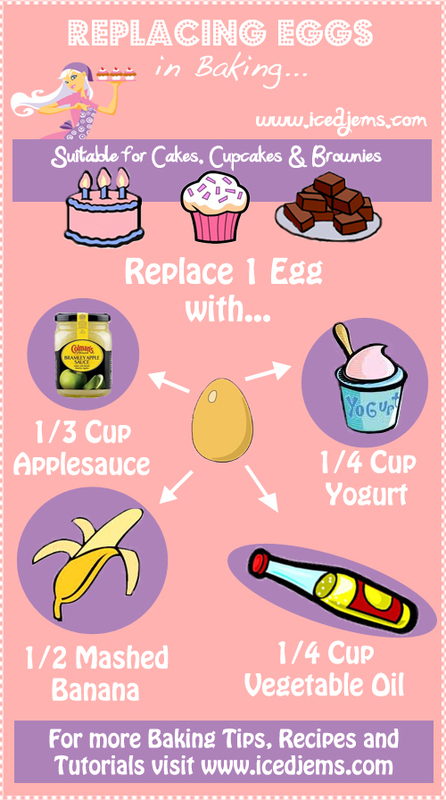 I will definitely try this recipe for my husband’s birthday! Jem, this is absolutely gorgeous. It’s such a refreshing change of pace from fondant character cakes and topsey-turvey cakes. It’s very sophisticated and I love the tutorial too. I’m not a baker but I do have friends that bake, so I’ve taken the liberty of posting the image of the finished cake (uploaded to my server – not using your bandwidth) on my blog. Of course I included a link back to the tutorial, a link to your about page, and a link to your tutorial page. I’ll definitely be keeping an eye on your blog and if my baking friends don’t get the message, I may have to be forceful. This is so gorgeous – you are very talented! I’ll be making this for a birthday on Friday and was wondering if you could help with a few questions I have please? 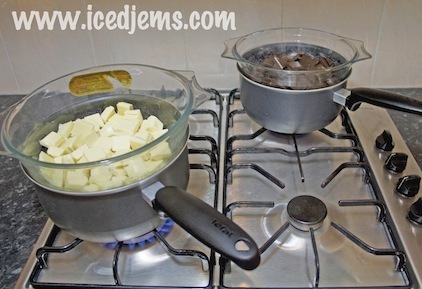 – What chocolate cake recipe did you use and what size tin did you use? I think that’s the perfect height and I’d really like similar height to my cake so it would help to know what size tin you’ve used. – I need to travel with the cake on Saturday afternoon so how far in advance would you say I would be able to stick the marbled pieces on? I’d like to do as much as possible on Friday evening but I’m hoping they won’t fall off or drop off or anything by Saturday afternoon? 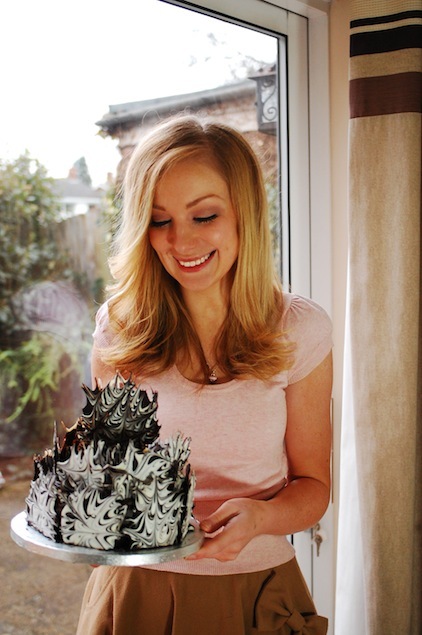 This cake looks stunning and yes, you are rhight: It is easy! have to try this for the next cake! Hi ! I make your marble chocolate cake last week but my chocolate decoration don’t become white and it was glued on the paper (sorry for my english but I’m french ^^). How can I solve this problem ? The cake looks fab, however, I have a question. The chocolate is left to set flat on the grease proof paper so how do get the pieces to fit together around a round cake. Surely they will break when fixing to the curves of the cake??? This is such a unique cake! I’m sure it tasted fantastic too, especially with all the extra chocolate! I just cant thank u enough for the amazing tutorial.U made my day.All hats off to u.Keep up the good work.I wld be extra delighted if u cld post an eggless choclate cake recepe.My cake tastes doughy. Thank you so much for pointing me in the direction of your tutorial. It really does look beautiful. 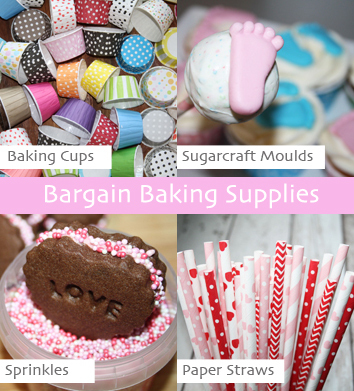 Could the pieces be made in advance & stored in a tin or airtight container? Woow ! I am impressed. You make it look so easy. Will try it soon and keep you posted. Thanks again for sharing. You are so talented and creative. Hi! I love the tutorial — thanks for sharing, I actually tried this before and failed (total guesswork) I didn’t realise you had to cut the bottom to make a sharp edge haha seems so simple now! Thanks soooo much for the heads up! Love this cake but how do you cut into it? It’s so amazingly decorated! I love it! omg i’m gonna do this tonight!! Great tutorial! I tried it out with blue and white and made “waves” for a fish themed birthday cake. You can check out the results on http://cupofsugarpinchoflove.blogspot.com/2014/11/birthday-cake-take-two-or-fish-food.html if you’re interested. Thanks again! Thank you, for sharing this detailed tutorial. 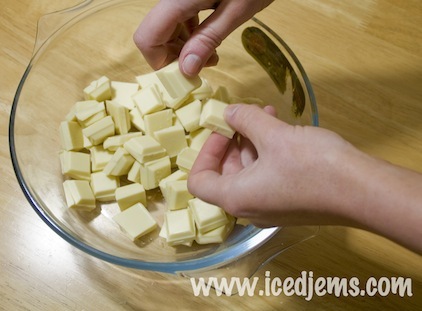 I baked a white chocolate frozen themed cake following these instructions. I wish I could share a pic with you. Saw this cake on Pinterest n loved it instantly. Use for those designs?? Do chocolate chips, chocolate and vanilla bark work?? I have made this amazing cake for my daughter’s Birthday today and everyone stunned. 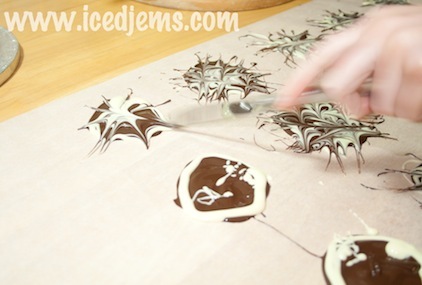 Can you make the leaves ahead of time and perhaps even freeze the decorated cake?